Constructed a century ago amidst the frenzied preparations for San Francisco’s 1915 Panama-Pacific International Exposition — and conveniently located near the bayside fairgrounds — St. Vincent de Paul Catholic Church soon became known as the “Exposition Church.” The church opened with a celebration mass on October 26, 1913, about 16 months before the exposition’s February 1915 festive opening day. The building sits imposingly at the corner of Green and Steiner Streets, on land purchased for the parish by Henry Hoffman. Perhaps because of its location, but possibly also as a result of its unusual design, worshipers — both locals and visitors — flocked to the church. So popular was the church that the mass schedule was expanded during the run of the exposition. Designed by the architectural firm Shea and Lofquist, the building incorporates an earlier, much smaller structure built in 1901. Archbishop Patrick J. Riordan officially formed the parish on August 24 of that year. 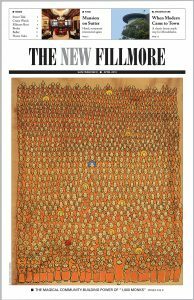 Father Martin P. Ryan, an Irish priest, celebrated the parish’s first mass at a hall near the intersection of Fillmore and Greenwich on September 22, 1901. 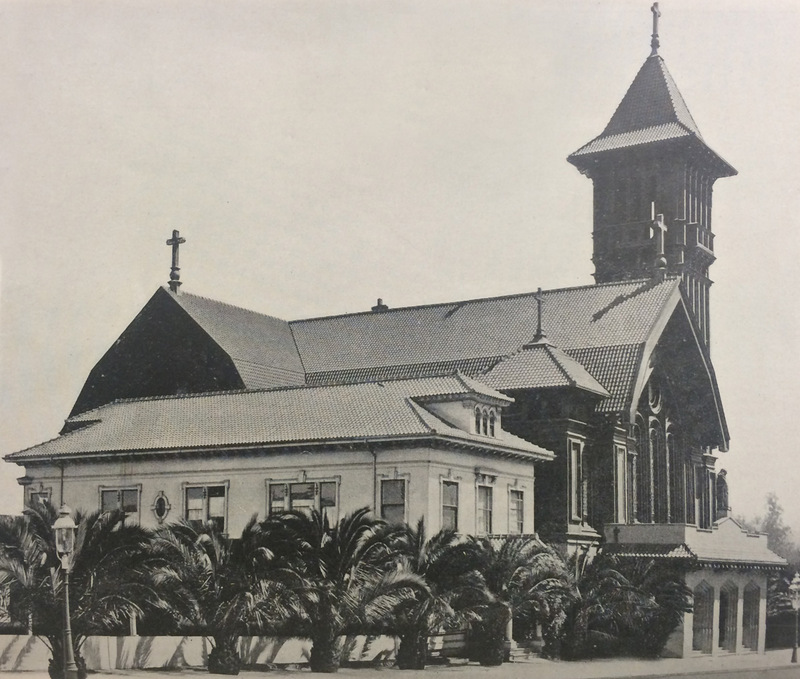 The next year, a rectory and a one-story church were built at the current location; both structures survived the 1906 earthquake. Construction on the present structure began in 1911. But the project was too ambitious for the young parish, and for various reasons the designs were set aside. Perhaps the catastrophic events of the 1906 earthquake further complicated the matter, delaying construction of a new church. The parish remained without a fully realized church until 1913, when the present structure was completed. 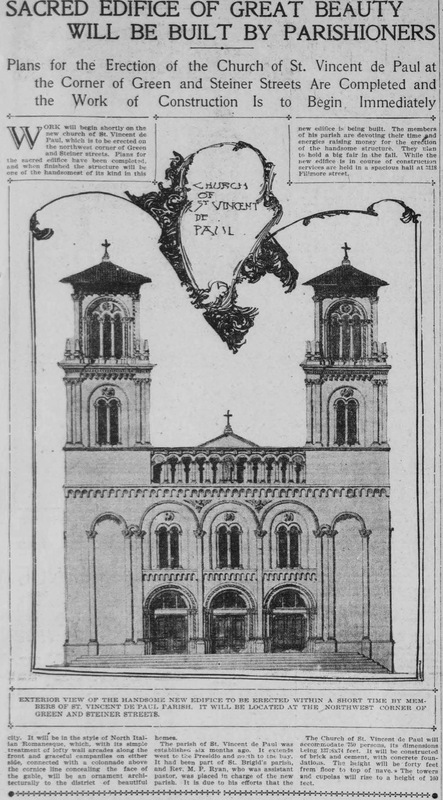 The architects of St. Vincent de Paul, Frank T. Shea and John O. Lofquist, formed a partnership after the earthquake and collaborated on a number of ecclesiastical projects for the Archdiocese of San Francisco, including: the new church at Mission Dolores (1913-18); a rebuilt post-earthquake St. Patrick’s on Mission Street between 3rd and 4th Streets (1906-14); St. John the Evangelist in Bernal Heights (1909-10); and the Salesian Church of Saints Peter and Paul in North Beach (1912-13). Frank Shea’s brother, William D. Shea, was also an architect, and together the brothers designed additional church buildings for the diocese. Frank Shea was the San Francisco city architect from 1893 to 1897. William Shea served as city architect from 1905 to 1907, but his service ended as a result of the graft trials that scandalized the city after the 1906 earthquake. Shea and Lofquist were among many architects and partnerships submitting designs for the San Francisco City Hall competition of 1912, ultimately awarded to Bakewell & Brown. At St. Vincent de Paul, Shea and Lofquist deviated from their previous ecclesiastical work, crafting a truly San Francisco church drawing on stylistic precedents, but blending a variety of architectural vocabularies. Purportedly, Father Ryan had spent time in Switzerland and was fond of Swiss architecture; he apparently asked the architects to look to the Swiss for inspiration. The church and parish house originally had tile roofs, which would have made the building’s appearance quite different, infusing a California “Spanish” aesthetic. St. Vincent de Paul in 1916, before the entry vestibule was removed. Featured in an October 1916 article in Architect & Engineer by Frederick Jennings titled “The Charm of a Tile Covered Roof,” the church and parish house stand alone on the block before the school structures were built. Canary Island date palms line Green Street, a popular landscaping choice of the time. Also visible is a one-story entry vestibule at the front of the church, which was removed later. 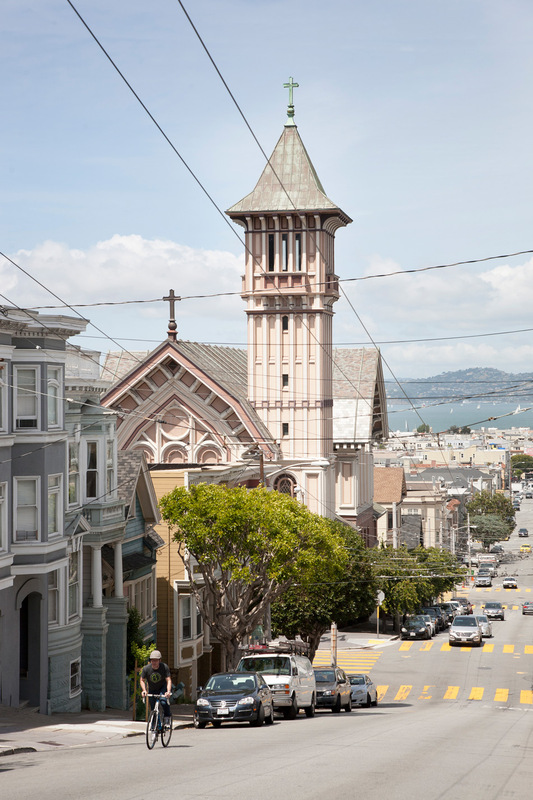 The church’s tower and gambrel roofs are prominent features within the primarily smaller scale landscape of residential Cow Hollow. The base of the church is sturdy brick, with a superstructure of wood. The heavily bracketed overhang of the gambrel roof reflects an inverted hull of a ship. Set within the gable ends facing both Green and Steiner Streets are three arched stained glass windows capped by a rose window, which fill the church with infused colored light. The St. Vincent de Paul School was erected adjacent to the parish house in 1924. 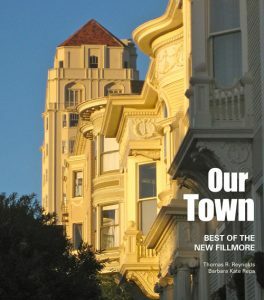 In the 1940s, Carl Hunecke of San Francisco’s Century Stained Glass Studio installed the church’s stained glass windows, currently undergoing repair and restoration by Nzilani Glass Conservation Studio of Oakland, which was also responsible for recently conserving the windows at the neighborhood’s Swedenborgian Church. St. Vincent de Paul has been an imposing edifice in the neighborhood for more than a century. I walked down the aisle of this church, flanked by my father and my sister, to marry my husband. For me, it is both a personal and an architectural landmark. Thank you to my friend Mary Noonan for arranging access to Rev. John Kevin Ring’s The Church of St. Vincent de Paul: One Hundred Years, 1901-2001, published by the church.